WHY YOUR VALUABLES ARE SAFE WITH US? Your Safe deposit locker or box is stored in a Grade TEN EX CD highly secure 6-sided vault tested in accordance with the European standard EN-1143-1. This verifies resistance to burglary including demanding explosive (EX) and core drill (CD) tests. There is no publicly accessible Safe Deposit Facility within the U.K. (and probably across Europe too) with a higher graded vault. 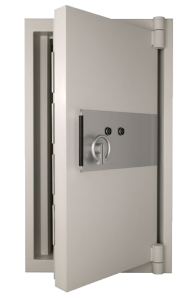 All our safe deposit lockers are made in Sweden, tested and certified by SSF in accordance with the standard SSF 1048-2 (the only standard in Europe for deposit lockers). Each safe deposit box is individually alarmed and has two locks. One lock is electronic and released by using your smartcard and pin code (set by you). The other lock is released using your secure customer key (only ever held by you; we do not hold spares). Access to your vault and locker is strictly limited to registered and authorised customers only. A combination of biometric credentials (Palm Vein - vastly more secure than fingerprint technology), RFID smartcard and PIN number are required to enter the vault and unlock your locker. Customers must also pass through multiple highly secure doors (airlocks) using their access control credentials to enter the vault. Our bank grade alarm systems (actually our systems are a higher specification than most banks) are monitoring 24 hours per day securing the vault and premises and notifying the Police and Fire Service when required. These systems combined with our staff, procedures and training ensures your items are kept secure. The premises are also monitored using the latest 4k HD camera technology.